Tiled surfaces appear in many areas of a home. From flooring and showers to fireplaces, countertops, and backsplash, tile and its counterpart grout can be present in many rooms of your home. But as with any form of building material, both tile and grout come with their share of problems. If you deal with tile issues, you are not alone. Having an idea of what issues can arise can keep you on top of proper maintenance and ahead of future problems. Here are some of the biggest issues homeowners face regarding grout and tile. Put floor mats around your home’s entrances and place furniture pads on the bottom of your furniture’s legs. Have your tile routinely cleaned and sealed to prevent major scratches from occurring. Remember that surface scratches are much easier to fix than deep scratches. The appearance of grout and tile cracks can sometimes be out of your control as a homeowner. One of the major causes of grout cracks is the shifting of a home’s foundation or subfloor, which will happen in every home. Most grout is rigid, while foundational concrete absorbs moisture and expands and contracts with temperature. This movement can cause grout and tile to crack. Stains are especially common in naturally porous stone tiles like granite or marble and in grout. A porous substance will easily soak up spills, leaving behind pesky stains. It’s impossible to keep spills from occurring, so the easiest way to avoid these issues is with a professional grout and tile cleaning and sealing. One of the most common causes of loose tile is a lack of adhesive during installation. If not enough adhesive is used when laying the tile, it can begin to shift and loosen as time goes on. This can become a serious safety hazard and can lead to further issues with your tile. The look of your grout plays a huge role in the overall look of your tile, so when your grout’s color is inconsistent, it drags down the entire tiled look. Grout discoloration can be caused during the installation phase when the grout is mixed with too much water. A buildup of dirt and grease can also cause your grout to be discolored, as can using the wrong cleaning agents like bleach and ammonia. The continual usage of these products can cause inconsistencies to form in the color. Walking over your tile with your bare feet can cause natural oils and dirt to discolor your grout, especially if you own a pool and track in the chemicals. Tile that is exposed to water can experience mineral buildup. If you see a heavy, white haze covering your shower, bath, or pool tiles, mineral buildup is your problem. All water contains minerals. Certain types of water, such as well water, can contain higher levels. As the water coats your tile, so do the minerals. But as the water evaporates, the minerals are left behind, creating mineral buildup. Mold and mildew are especially big issues in areas prone to moisture, including shower tile, bathroom floor tile, and backsplash around sinks. The grout surrounding your tile is porous and absorbs moisture, creating the perfect breeding ground for mold and mildew (especially in a shower where soap scum is also present). Learning how to spot mold and how to eradicate it can help keep it from spreading out of control. 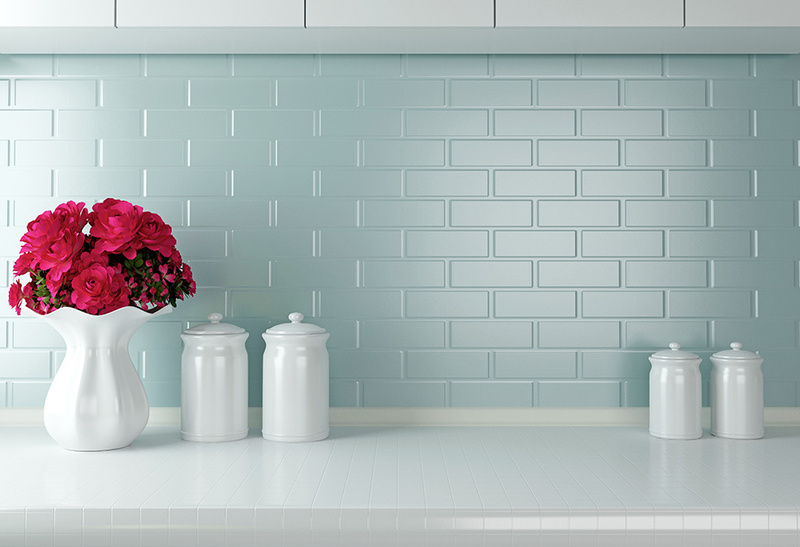 It can be especially difficult to keep kitchen grout clean and sanitary. Because it is porous, grout likes to harbor bacteria, making surfaces unhygienic. While this can be an issue with any grout, this can especially be an issue for grouted countertops in the kitchen, where food preparation occurs. It is important to regularly seal and clean your grout to keep the germs from penetrating its surface. Natural stone can be prone to a process called etching. Most natural stones are porous. They are therefore sealed to keep from staining, as well as to bring out the natural vibrancy of the stone. However, without proper sealing, acidic substances that come in contact with the stones can seep into the pores and cause etching, which dulls the look of your stone tile. In some stone, it can even cause the texture of the stone to change. Etching can occur in a variety of tile materials including ceramic or porcelain, but it is an extremely common issue for natural stone. Don’t retreat from issues with your grout and tile. Face them head-on. You can have control over these issues and keep them at bay by maintaining and routinely cleaning and sealing your tile. And with the help of a professional grout and tile cleaning company, you can eradicate problems that have already arisen while also treating your surfaces to make maintenance easier and more effective. The Houston Groutsmith team uses only nonacidic cleaners and never uses harsh cleaning methods like high steam or carpet cleaners on your grout and tile. We want to protect the integrity of all tile surfaces in your home while providing you with easy to maintain tile. See our grout and tile cleaning services for more information on how our team can benefit your tile. This entry was posted in Grout Cleaning Houston, Tile Cleaning Houston, Tile Cleaning Tips. Bookmark the permalink.